This site is dedicated to providing online access — free of charge — to the entire contents of Ray’s New Arithmetic: Primary, Intellectual and Practical (the first three volumes in the series). 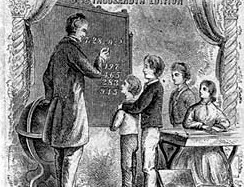 Ray’s was a comprehensive series of public school math textbooks written by Dr. Joseph Ray, and were used widely throughout the mid-to-late nineteenth and early twentieth centuries in America. What’s so special about offering FREE online access to these books (downloadable PDFs)? Nothing. Other sites do that. However, this site, in addition to the free PDFs also offers free video lessons based on these textbooks, grades K through 5. The video lessons are free of charge, available for viewing here and also on our Ray’s Arithmetic You Tube channel. Besides the video on each lesson page, there is also the actual Ray’s Arithmetic lesson included from the book directly below the video. In other words, you don’t even have to go to the printed pages of the book (PDF) to refer to a particular lesson because the lessons themselves are RIGHT ON THE SCREEN! Well, my fellow homeschooling parents, grandparents and advocates/promoters/defenders of educational liberty and academic freedom — and other interested folks who just want to be well-grounded in the fundamentals of mathematics — it means that you now have an easy-to-access, easy-to-use resource for incorporating this classic and very powerful math learning tool into your personal and family study regimen, which has served generations of children well and continues to serve students of all ages well into the 21st century. It also means, we have a LOT of work to do! I don’t know how to thank you enough for the effort you’ve put in. This is the most exciting thing I’ve seen since I found Ray’s! Thank you! Thank you very much! God Bless you. Wow! What a blessing. I can not thank you enough! I appreciate all the kind remarks. This is amazing! I have been struggling to find a math curriculum for my young boys and this seems to be just what we need. I appreciate the hard work you put into the video lessons! I’m interested in using this next year. Are there answers for the problems available by chance? I have recently discovered Ray’s Arithmetic, and I have all the books needed for this year printed! I was looking at your YouTube channel, and (as a novice YouTube watcher) I was really confused. Do you have different playlists for different “grade levels?” I was looking for the videos for grade 5. Thank you so much for your time and hard work! You’re welcome! There are no playlists for the grade levels. What you’re seeing are videos from two different sources: Ray’s lessons from the Primary Arithmetic book (grades 1-2), and a few selected videos from my full-year Ray’s math courses, grades 1-4 (offered through Ron Paul Curriculum). Hi there, another question, I’m sorry. Is there a “Scope & Sequence” type of file for Rays? I’d like to see what is covered in which years to decide what year would be best to start a student in. Thank you again for everything! What a Godsend!!! Absolutely. Mott Media publishes a parent-teacher guide for the Ray’s math books: author Dr. Ruth Beechick. It’s very helpful. It guides you through the “scope and sequence” of the Ray’s books and what grade levels they correspond to.